This bushy plant is used to add a bitter flavour to drinks, as in "dandelion and burdock". The roots were also used as a source of vitamin C to protect against colds and 'flu. 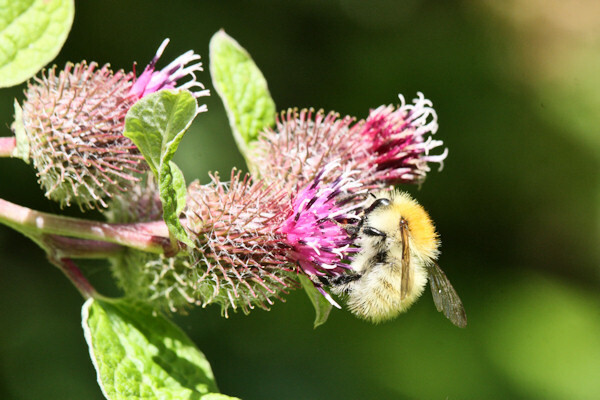 It grows in a variety of habitats - by roadsides, in waste ground and in woodland. It always seems to attract plenty of insects in my garden. The flowers are reddish-purple and the fruits are hooked to attach to fur or clothing. The leaves are heart-shaped. 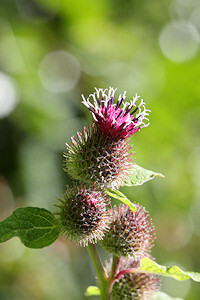 Very similar to greater burdock, but does not grow so tall.